“We are teaming up with our federal partners in new ways that will further this work and more effectively target illegal guns and criminals in our community,” Shapiro said. 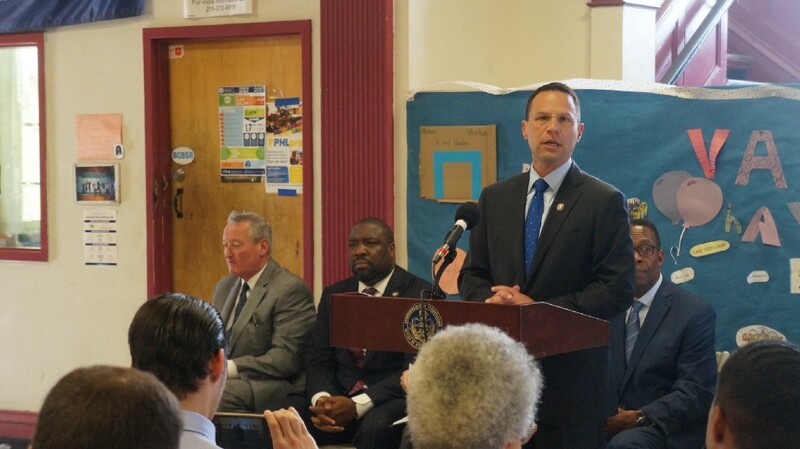 Pennsylvania Attorney General Josh Shapiro took to the Vare Recreation Center in Point Breeze Wednesday afternoon to announce a new, joint effort between his office, and city and federal law enforcement partners to act with an “unprecedented” level of cooperation to target illegal gun trafficking in Philadelphia. Also at the meeting were a number of officials from the city, state and federal government including Special-Agent-in-Charge for the Philadelphia Division of the Bureau of Alcohol, Tobacco, Firearms & Explosives Don Robinson, Philadelphia Police Commissioner Richard Ross, Mayor Jim Kenney, District Attorney Larry Krasner, City Councilmen Darrell Clarke and Kenyatta Johnson and First Assistant U.S. Attorney for the Eastern District of Pennsylvania Jennifer Williams. Since the Gun Violence Task Force, a city-wide, joint task force between the city’s district attorney’s office and the Pennsylvania Attorney General’s Office, was initiated a little over a decade ago, according to Shapiro, the task force was able to get 2,438 illegal guns off the city’s streets. Additionally, the task force has arrested 1,439 perpetrators involved in straw purchases, gun trafficking and other criminal activity, Shapiro said. The task force has a conviction rate of 78 percent. In 2018, the Gun Violence Task Force has recovered 80 guns, made 75 arrests and opened 328 investigations. The Office of Attorney General, Philadelphia police and the District Attorney’s Office reached an agreement with the Philadelphia Field Division of the Bureau of Alcohol, Tobacco and Firearms (Philadelphia ATF) this past spring to share more information and conduct joint investigations into illegal gun trafficking. Through this initiative, investigative teams consisting of one ATF agent, one Office of Attorney General agent and one Philadelphia police detective will work together to coordinate leads from their respective agencies, conduct interviews and gather evidence to target individuals who perpetuate gun violence, namely straw purchasers. “Nearly every gun crime in the city of Philadelphia starts with an illegal straw purchase,” Shapiro said. According to Krasner, who spoke at the press conference, it is “extremely common” for straw purchasers to be significant others, friends or family members of perpetrators. He said the country should have sensible gun safety laws just like it has sensible automobile laws. A press releases provided by the attorney general’s office gave an example of a few specific examples of incidences where information-sharing led to arrests. Just last month, Philadelphia police conducted a traffic stop and discovered a large number of explosive devices in the car. Through information-sharing with the ATF, agents searched the suspect’s home and made an arrest, the press release says. ATF then announced a Philadelphia man suspected of planting explosive devices on ATM machines in the city was in custody. Another example resulted in felony charges against two Northeast Philadelphia men who straw purchased 11 handguns. During the search of one of the men’s residences, investigators found cocaine, heroin, two ballistic vests, more than $2,000 and another gun with 30 live rounds. This case was also built with strong cooperation from community stakeholders in the Northeast.